You do not have to be a great artist to sculpt. What I have found out over the past couple of years is that the more you do, the better you get. Just like painting you get better with practice. I started with little things such as tables, shields, & monsters. The best thing about monsters is that they do not have to be scale, what I mean is the feet can be too big, and still look good because it is a monster. The size of things is not important when you start, because you develope your own style. Scale will come in time after practice. The other thing I have learned is the tools make all the difference in the world. I started out sculpting with a exacto blade, a tooth pick, a steel dart tip, and a wooden tool I took out of my wifes old nail polish bag. I threw them into my black box. Which was my sculpting tool kit for miniature. I used sculpey and greenstuff, the sculpey is good for practice and it bakes hard in 30 minutes in the oven. The greenstuff is more expensive and I saved it till I got good. For a while I sculpted with the tools I threw in the box. It worked fine for some stuff, but I found myself needing smaller tools. My mini tools are a direct result of that need. So tools are very important to miniature sculpting. The next thing I did was layers, lots, and lots of layers. You have to build a miniature in layers. I use copper wire to make a frame like a skeleton it helps hold the shape togeather. I put on a thin layer of putty on this frame and let it dry. This is a skinny version of a basic shape I want. After this is dry I add basic muscle groups. Then I let it dry again. You may be wondering what I do with the green stuff left over when a certain part is drying. TRICK:" I put my green stuff in the freezer, yes the freezer. I read this somewhere and it works. The longest I have left it is over night about 8 hours. I could not believe it, but I used it the next day. I do not make it a habbit, but it saves time and money." I then start to add a layer of clothes or chainmail. My first attempt was a Dwarf and I did the body and used a Warhammer Dwarf head to finish it, as well as the Warhammer Dwarf hands. I knew I needed more practice on faces and hands, so I did'nt even try. Then I practiced on hands, faces, nose, ears, eyes, teeth, & hair. I did this with green stuff to get a feel for it. After a bit of practice I did the Fat bar maid. Which was my second figure ever. Then I did the Dwarf which was my third figure, then I lost count. Now I do all sorts of different pieces. I think the practice and tools are the two things that improved my sculpting the most. Below are some tips for working with green stuff. Use water to blend green stuff to already dry green stuff. A flat tool works good for pockets, pouches, and hands. Layer the detail bit by bit and always let it dry. Anything less than 1mm is too thin to make a mold for. The other putties are brown, and a blue. They sand easier, and do not shred like green stuff. A 25 watt bulb on a 5# coffee can works to dry it faster. Use different mixes to get different results. Experiment with mixing 1 putty with other putty. Use a piece of a removable pencil eraser for smoothing skin. My tools helped sculpt this. My tools are available in a two pack called the Starter pack. Also in a five pack called the Pro set. I hand make these tools for miniature sculpting. Believe me the right tools make all the difference in the world. The Starter pack is $25.00 and the Pro set is $50.00. All seven tools are $60.00 plus shipping. I have what I call a 60/60 plan. They cost $60.00 with a improve your miniature sculpting or I will refund your money back in 60 days policy. 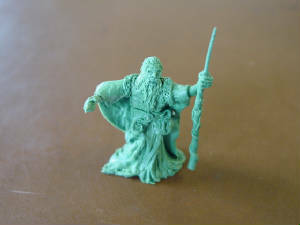 My first mini- a wizard I did with the tools. Not to bad for my first ever mini. I know I do not know everything. So for those of you who want to add to the SCULPTING tip list please do so. Some of the tips may help the next person who looks at this page. Try to keep it short and to the point. I will post them here for other readers. If you have any sculpting advice for people email me and I might post it here.